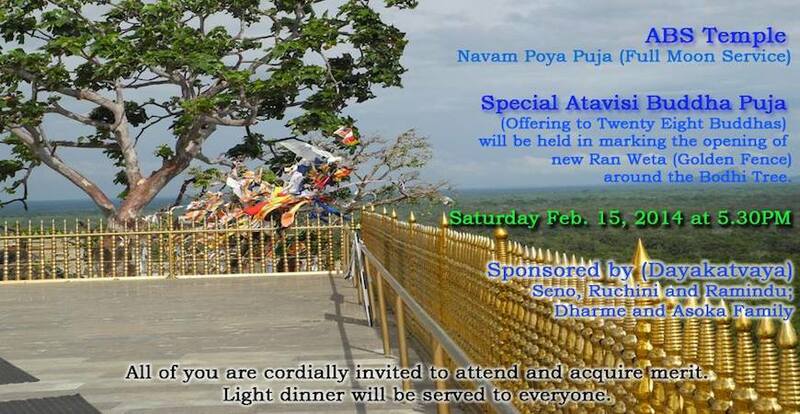 Navam full moon has special significance for the Buddhists in Sri Lanka and in the world. The two very significant incidents that took place on the Navam Pura Pasalosvaka Poya Day were the first congregation of Maha Sangha or the First Buddhist Council, and the appointment of two chief disciples of Gautama Buddha as Aggasavakes namely Sariputta and Moggallana. The first Buddhist Council was held three months after the passing away of the Buddha. It was chaired by one of the most senior monks in the order – Mahakassapa. Five hundred bhikkus participated in the Council. Mahakassapa Thera kept a vacant seat for Ananda Thera, as he was not an arahat till the day before the Council. Anyhow, on the eve of the council, Ananda attained the arahathood and he participated in and played a key-role in Council. Ananda, was a cousin of the Buddha. He was also a brother of the famous Devadatta and one of the ten Great Disciples. He accompanied the Buddha for more then 20 years. Venerable Ananda attained enlightenment after the demise of the Buddha under the guidance of Mahakassapa.